• ROOMS & SUITES: Panoramic rooms with wooden ceilings , all equipped with: air conditioning with individual control , minibar , digital safe , direct dial telephone and internet connection , TV/SAT ; marble bathrooms with jacuzzy hydromassage bat-tub or shower , hairdryer , towels-warmer. "Noble Floor" with spacious de luxe rooms with frescoes ceilings ; Penthouse Regal Suite: sitting room with sofabed , 2 bedrooms and 2 marble bathrooms with Jacuzzi bathtub. • ANNEXE : Il Borghetto del Mostaccio *** , 120 feet from the Relais , rooms and apartaments in a picturesque medieval court-yard , architectural vaults and wooden ceilings , rooms fitted with modern comforts. 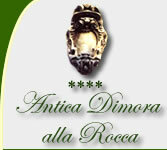 All service centralized and rendered to the Antica Dimora alla Rocca. • MEETING ROOMS : from 10 to 30 people are inside the hotel, whereas a large meeting room with about 100 seats is in the suggestive XIII century "Museum of San Francesco" located in the nearby. All meeting rooms are equipped with the most modern technology. • PARKING : private and covered, available for the hotel guests. • LA PREPOSITURA RESTAURANT Full licensed, La Prepositura Restaurant is an exclusive and elegant meeting place, where guests can taste the deliciousness of local and Mediterranean dishes, so originally cooked by the chef.It is divided in various rooms, which can be booked for business lunches so to assure guests the utmost privacy. To the hotel guests a rich buffet breakfast is also served, by a very professional and friendly staff. • BAR A comfortable bar tastefully furnished and peaceful: the best place to relax drinking one of our Barman's special cocktails. Click here to book your romantic weekend!